Good Morning ! Hope you are all staying warm ! 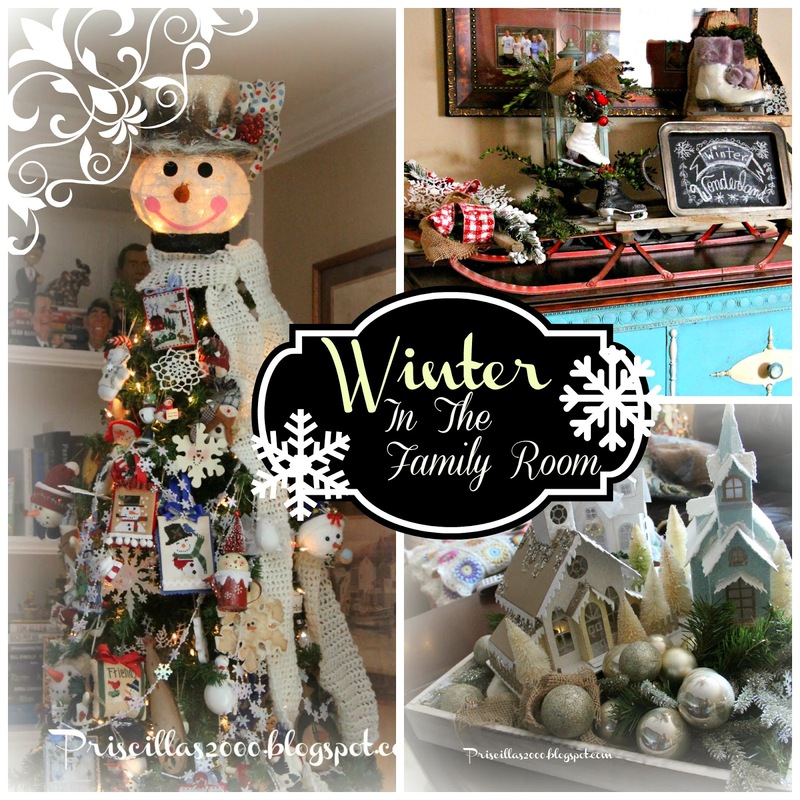 I am sharing our winter decorations in the family room today! I keep up one of the snowman trees at least til the end of January.. 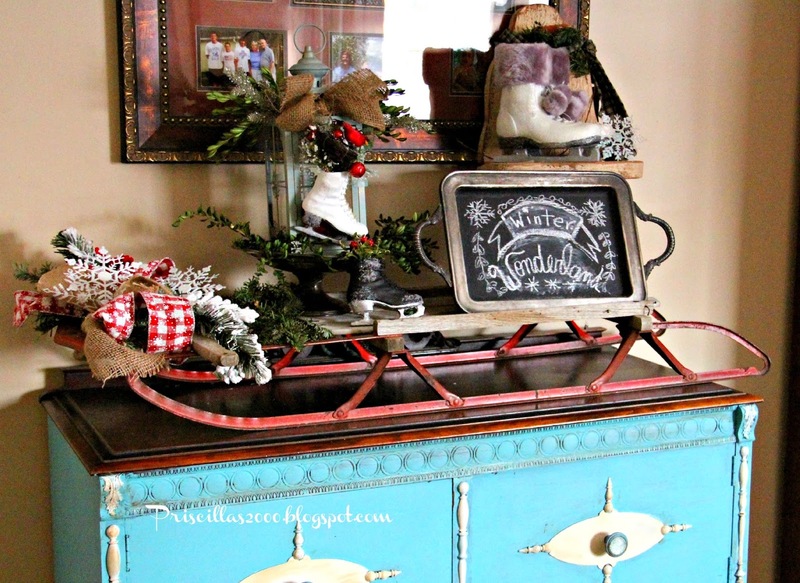 I left the vintage sled on top of the aqua cabinet, and added a winter chalkboard on a silver tray, sitting on a snowman chair , ice skate ornaments , ice skates and a lantern ..
On the sofa table, I used a snowman platter, another winter chalkboard, lanterns and more skates.. 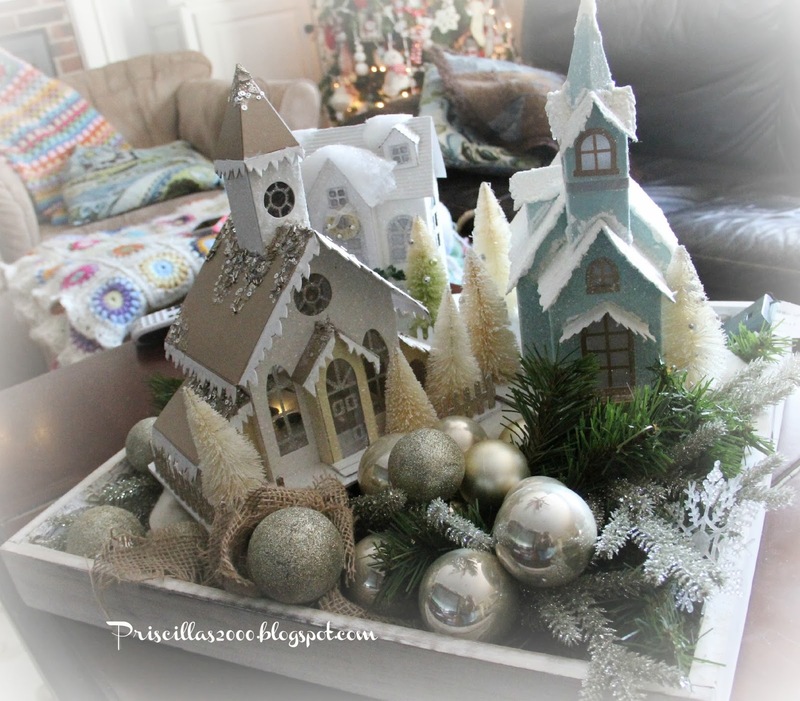 I used this wooden box to hold a glitter house( my daughter got me this one and also the one in the foyer this year ! 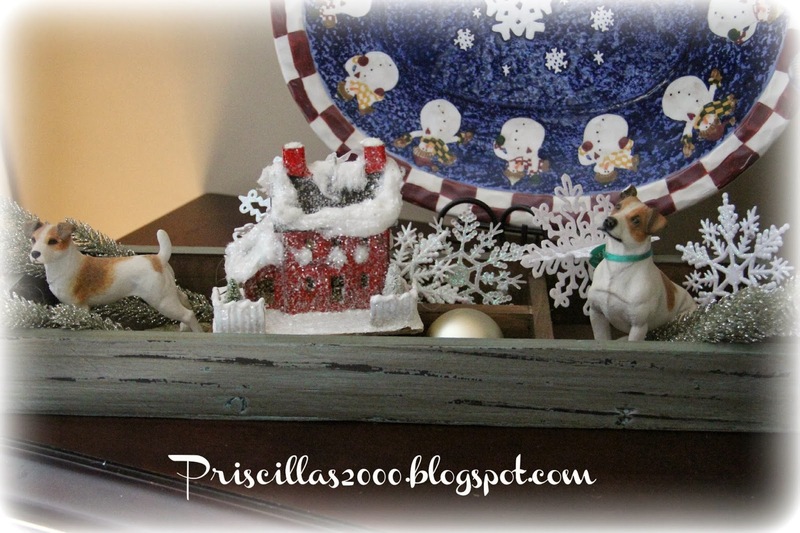 Love them ) , 2 jack russells ,some snowflakes and silver branches.. 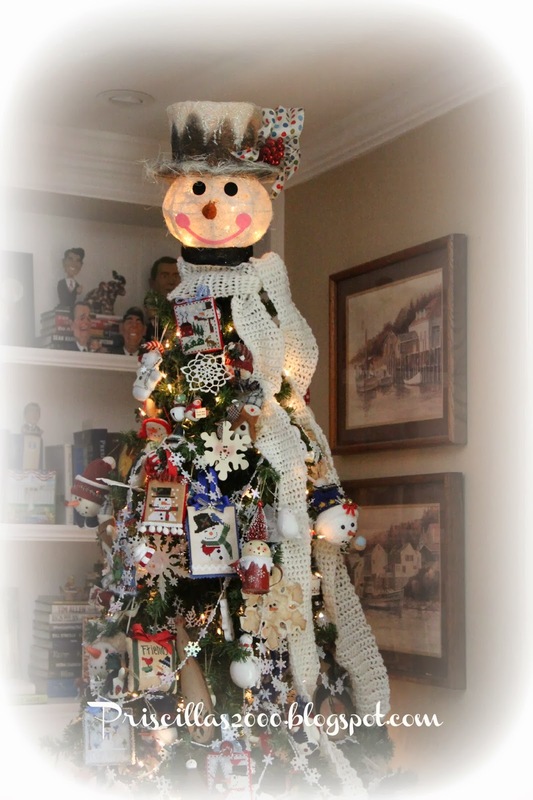 I decided to take the glittery floral picks off the top of the tree and crochet the snowman a scarf ! Doesn't it just look wintery ? 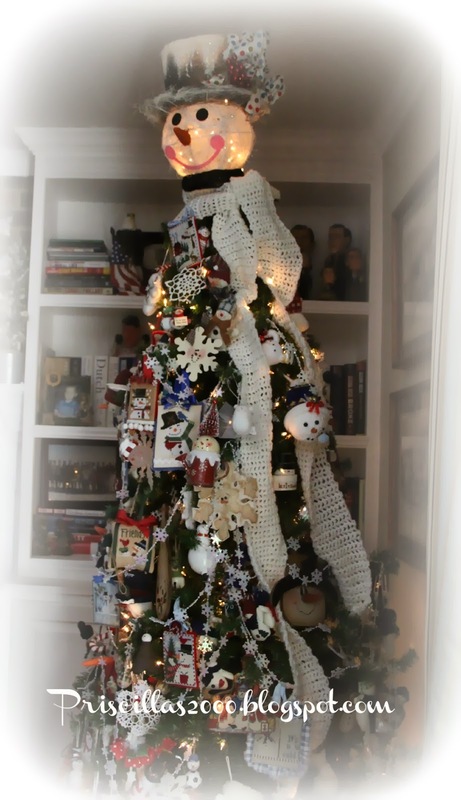 All the ornaments on this tree are snowmen , there are alot of cross stitched ornaments.. 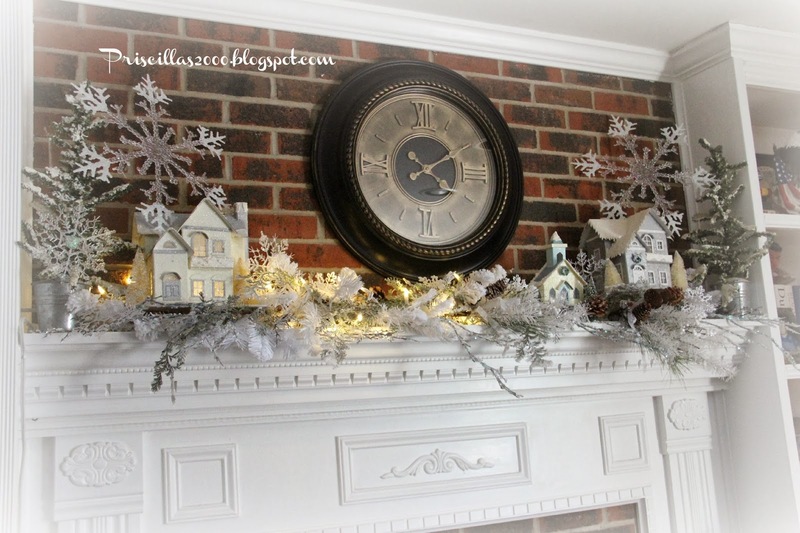 I left the glitter houses and white garland on the mantel, took down the White Christmas sign and put the clock back up.. 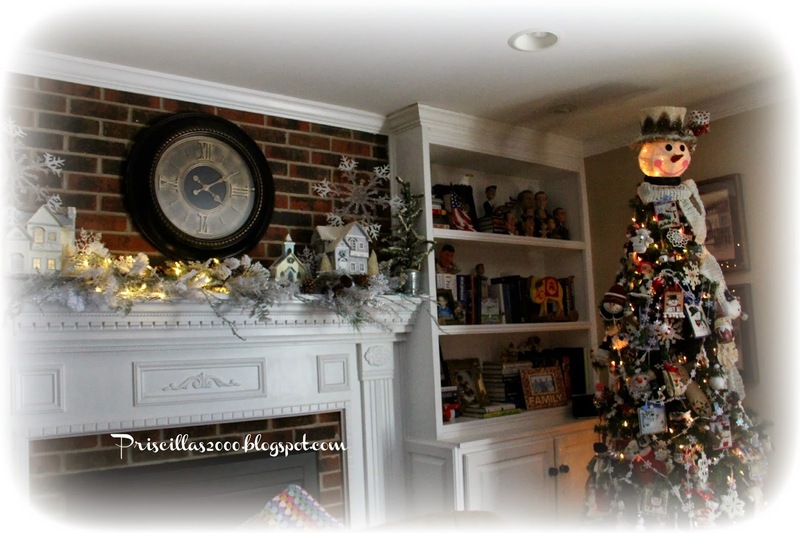 I love having the tree and garland lit , its so cozy for the winter.. I left the glitter houses on the coffee table ..all these decorations will stay put until the end of January , maybe into February.. I love your visits and nice comments ! The snowman tree is amazing. I do have a question Priscilla, where do you store things? Is it much of a problem? Your house is always so cozy and inviting!! i love he snowman tree. Your home decor is so pretty. 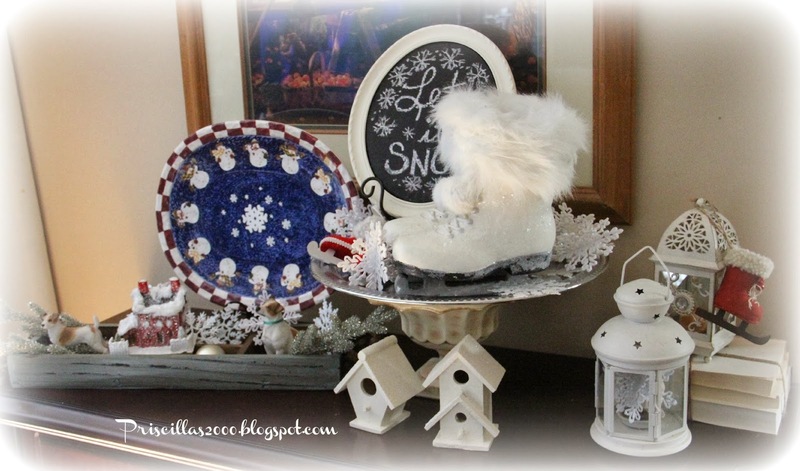 Great winter decor!…and that snowman topper is adorable!! !..Such cozy decor for winter!! I love your snowman tree, all those cross stitch ornaments, just beautiful. I keep my snow people out for January too. Your tree is adorable. Thanks for sharing. 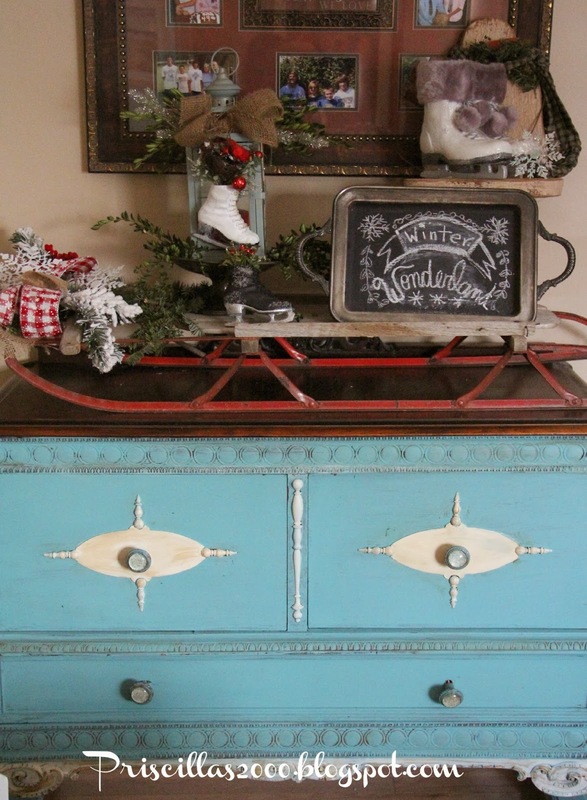 I love your Winter tree, mantel and vignette with the vintage sled! I love leaving a tree up for winter too. Your snowman theme is perfect! 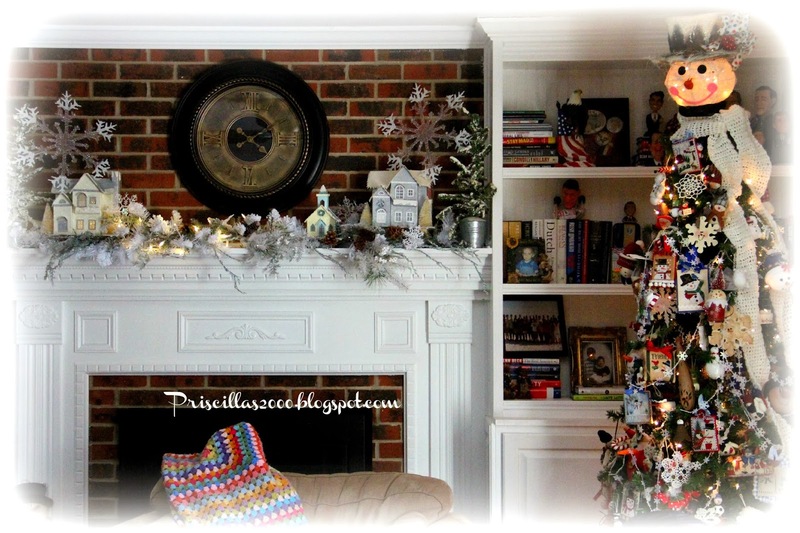 All the decorations have made your house look so warm and cozy. Love the snowman tree. Lovely decorations! I love all of your vignettes! Oh, how lovely. I just love the sled. I will feature tomorrow at Home Sweet Home! Grannies, Stitching, Soup ,Snow and Cold ! Grannying ,Stitching and Thrifting !